Background: Immunobullous diseases are morphologically heterogeneous and the differentiation between various subtypes is essential for proper treatment and prognosis. Aim of our study was to analyze and correlate clinical, histopathological and immunofluorescence findings in autoimmune bullous diseases. Materials and Methods: A cross-sectional study was done over a period of two years (2010-2012) after approval of the ethics committee. Sixty patients, who met the inclusion criteria of immunobullous disease, were included in the study. Skin biopsy for histopathology and direct immunofluorescence (DIF) examination was taken. DIF using salt-split technique was done in few of the cases. The final diagnosis was based on clinical, histopathology and DIF findings. Pearson's coefficient of correlation (r) was calculated. Statistical Analysis was done using Epi info version. 7.0. Results: Fifty-three cases with clinical diagnosis of autoimmune bullous diseases were evaluated. In 88.6% of cases, histopathology diagnosis was consistent with clinical diagnosis and in 75.5% of cases, DIF findings were consistent with clinical diagnosis. A positive relation was seen between clinical and DIF findings with r = 0.65 and between histopathology and DIF findings with r = 0.75. DIF positivity was seen in 100% cases of bullous pemphigoid (BP) and pemphigus foliaceous and 94.7% cases of pemphigus vulgaris, which was statistically significant with p < 0.05. In DIF salt-split test, deposition was seen on roof of blister in BP whereas on floor in epidermolysis bullosa acquisita. Conclusion: Our study provides evidence-based guidance for the diagnosis and classification of various immunobullous disorders. DIF test should be done in conjunction with histopathology for definitive diagnosis and to minimize both: False-positive and false-negative results. A cross-sectional study was conducted in Department of Dermatology, Smt. S. C. L Hospital, Smt. N. H. L Municipal Medical College from June 2010 to November 2012 after being approved by the Institutional ethics committee Board. The patients were selected from the in and outpatient department of the Department of Dermatology, and informed consent was obtained. Patients with a clinical diagnosis of autoimmune bullous disorders, irrespective of age and gender and willing to participate in the study were included. Patients not willing to be the part of the study or undergo the required investigations were excluded. 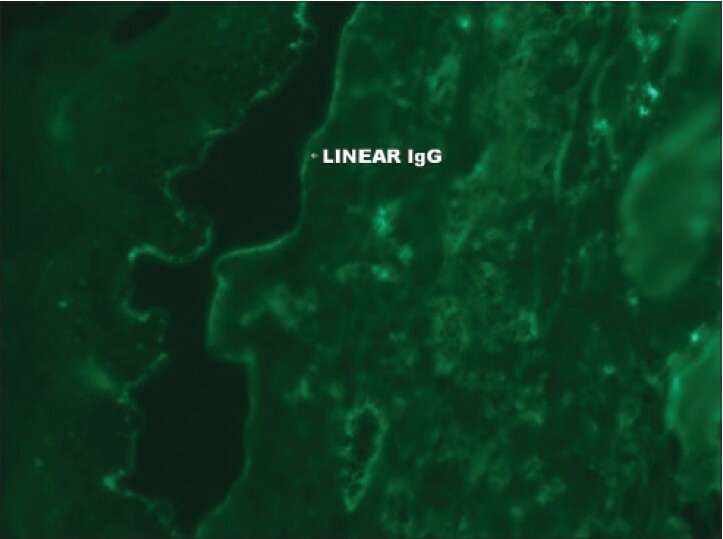 Direct immunofluorescence staining of peri-lesional skin specimen. A total of 53 cases, clinically diagnosed with autoimmune bullous dermatological disorders were included in the study. Skin biopsy sample (punch biopsy/excision biopsy) was the standard procedure for obtaining samples. Pattern of immune complex deposits: Granular or linear. The description of all these staining characteristics leads to immunopathological diagnosis. Digital photography was done to document the results. In this way, both histopathological and DIF examination were carried out in all included cases and findings were recorded. The definite diagnosis of these patients was based on clinical, histopathological and immunofluorescence findings. Analysis was done in Epi info version 7 and word excel. The Z-test of significance of difference in proportions of large samples was used. The Chi-square test with Yates correction was used to find the significance of difference in two more than two proportions. Pearson's correlation coefficient (r) was found. Above tests were used where ever applicable according to the sample size and type of data. The study group comprised of 53 cases of autoimmune bullous disorders of the skin, with 30 females (56.4%) and 23 males (43.6%). The age range of cases was between 5 months and 88 years with mean value 39.7 years. The clinical diagnosis of the predominant cases were pemphigus vulgaris (PV) in 19 cases (31.6%), dermatitis herpetiformis (DH) in 11 (18.3%), bullous pemphigoid (BP) in 10 (16.6%) and pemphigus foliaceous (PF) in 3 cases (5%). Two cases (3.3%) each of pemphigus erythematosus (PE), bullous SLE, linear IgA dermatosis (LAD), were seen [Table 1]. Discordance between clinical, histopathological and DIF diagnosis was noted [Table 2]. Overall, in 47 cases (88.6%), histopathology findings were consistent with the clinical diagnosis, and in 40 cases (75.5%), DIF findings were consistent with the clinical and histopathology diagnosis. 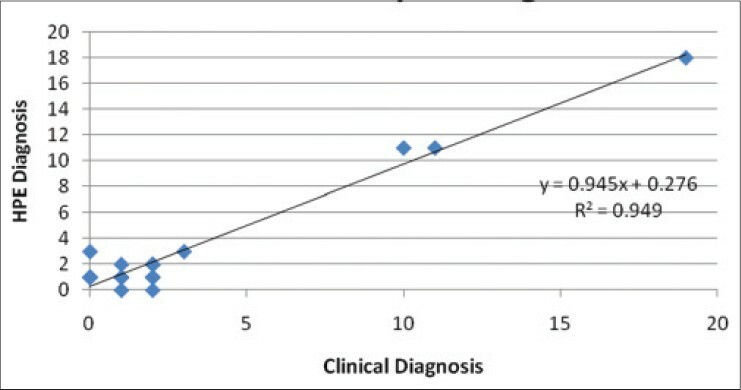 [Figure 1] shows the correlation between clinical and histopathology diagnosis. On applying Pearson's correlation coefficient, a positive relation was seen between clinical and histopathology diagnosis with r = 0.97. 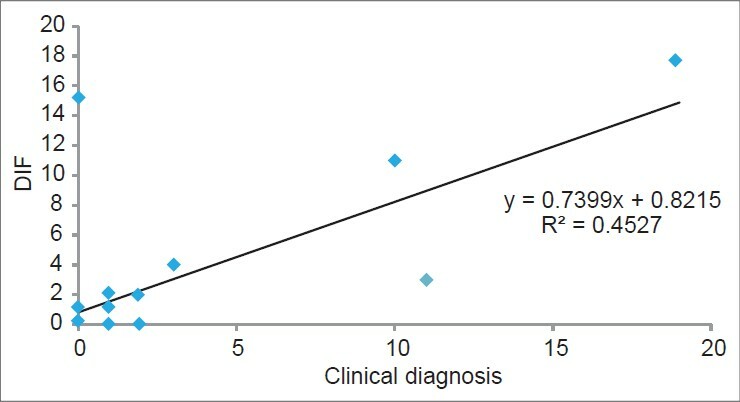 [Figure 2] shows correlation between clinical and DIF diagnosis. A positive relation was seen between clinical and DIF diagnosis with r = 0.65. 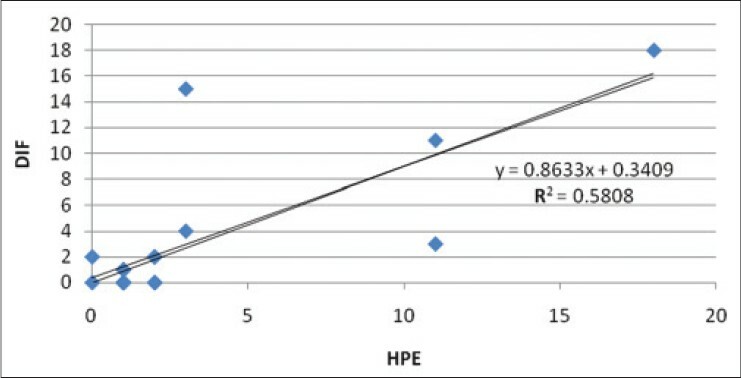 [Figure 3] shows correlation between histopathology and DIF diagnosis. A positive relation was seen between histopathology and DIF diagnosis with r = 0.75. 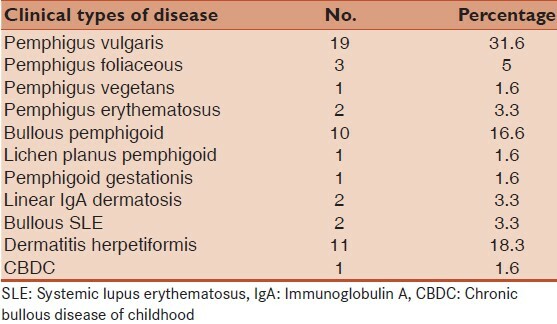 DIF pattern of deposition of immunoreactants in different disorders are shown in [Table 3]. Dermatitis herpetiformis: Out of total 11 cases, clinically diagnosed having DH, only 27.27% (N = 3) cases had a positive DIF test. IgA was the principal immunoreactant deposited in 67% of cases. 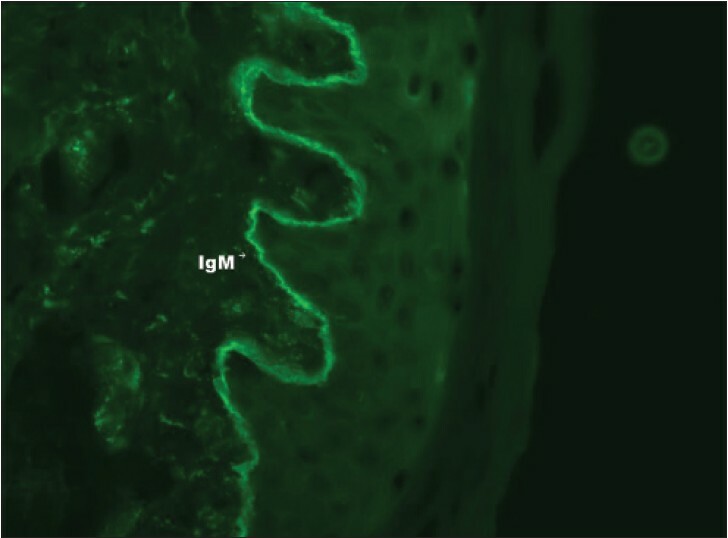 IgM deposit along dermal papillae was seen in one case [Figure 6]. On applying Z-test between various types of immunoreactants among various blistering disorders, it was found that immunoreactant deposition was statistically significant in pemphigus vulgaris, pemphigus foliaceous, pemphigus erythematosus, lichen planus pemphigoid and dermatitis herpetiformis, with P < 0.05 [Table 3]. Among subepidermal group of disorders, bullous pemphigoid (BP) can mimic epidermolysis bullosa acquisita (EBA) in clinical presentation, histopathological and DIF findings. In the present study, 4 cases having clinical and histopathological differential diagnosis of BP and EBA, direct salt-split immunofluorescence test was performed. Predominantly IgG and/or C3 deposition on the roof of blister cavity was seen in 3 out of 4 cases, favoring diagnosis of BP. 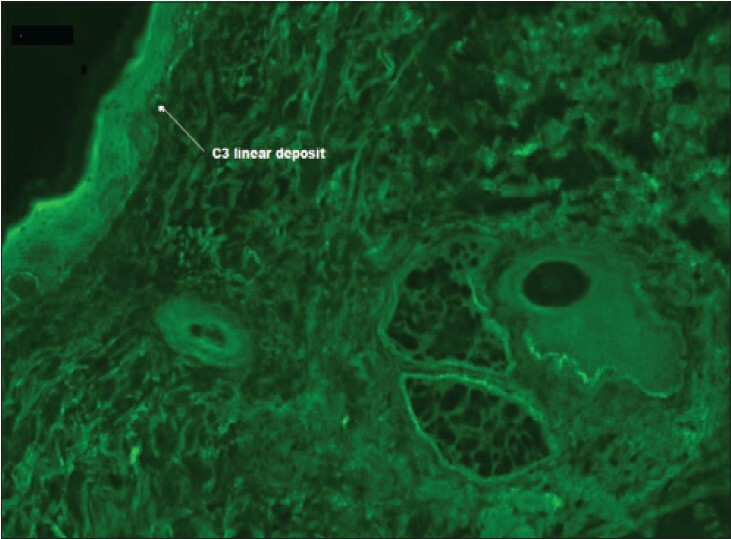 In one case, IgG deposits were seen along floor of blister cavity, favoring diagnosis of EBA [Figure 7]. Out of 19 cases, clinically suspected as pemphigus vulgaris, DIF was found to be consistent with the clinical diagnosis in 18 cases. In all the 3 clinically suspected cases of pemphigus foliaceous, light microscopy and DIF diagnosis was consistent with the clinical diagnosis. 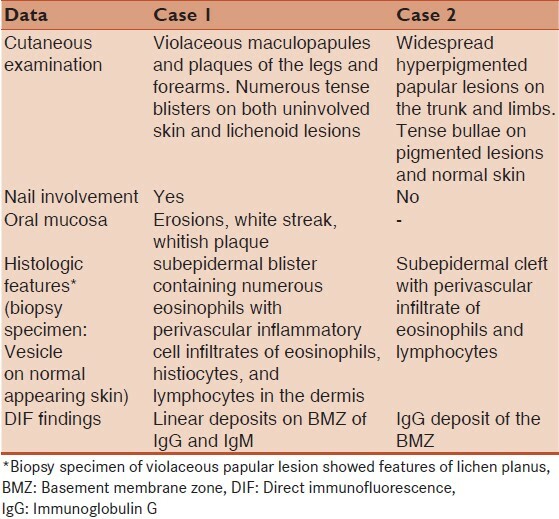 One case, clinically suspected as pemphigus vulgaris, after histopathology and DIF examination features turned out to be of pemphigus foliaceous [Table 2]. A total of 10 cases of clinically suspected bullous pemphigoid were analyzed by DIF, 100% cases were consistent and one additional case, clinically diagnosed as LAD was picked up on DIF and light microscopy [Figure 8] when there was no clinical finding in favor of BP. [Table 2] In DIF microscopy, linear IgG and/or C3 deposition in BMZ were observed in all cases [Table 3]. Another case clinically mimicking linear IgA disease, turned out to be a case of disseminated herpes virus infection. Tzank smear and polymerase chain reaction (PCR) from vesicular fluid for herpes simplex was positive, patient responded well to antiviral treatment. Histopathology findings were also in favor of viral etiology and DIF was negative. Histopathological findings were consistent with the clinical diagnosis in 100% (N = 11) cases of dermatitis herpetiformis (DH). Granular deposition of IgA and C3 in the papillary dermis and along the BMZ is diagnostic if DH deposition of IgG or IgM or both is less frequent and less intense. , However, only in 3 of 11 cases DIF findings were consistent with clinical diagnosis of DH. Our observation of only 27% of cases with a firm diagnosis of DH and actual negative findings by DIF (73%) is in agreement with the sensitivity of DIF reported in literature. In a study of Banu Lebe et al.,  only in 3 of 58 cases of histopathology and DIF findings were in accordance with clinical diagnosis. The authors reported that the possible reason for this discordance may be due to pruritic papulovesicular eruptions of DH that evolved and disappeared rapidly and could be the inclusion of DH to clinical differential diagnosis by clinicians in many pruritic papulo-vesicular eruptions. Selection of biopsy site, technical errors and treatment status may result in false negativity of DIF. One cases with clinical differential diagnosis of EBA or DH, histopathology and DIF findings were in favor of BP or EBA. In DIF salt-split examination, immunoreactant deposition was seen in the floor of blister cavity, favoring the diagnosis of epidermolysis bullosa acquisita [Figure 7]. Out of 2 cases with final diagnosis of lichen planus pemphigoides (LPP), clinical diagnosis was consistent with histopathology and DIF diagnosis in one case. In second case, on basis of clinical presentation, differential diagnosis considered were bullous lichen planus, dermatitis herpetiformis. Histopathology and DIF findings were suggestive of features of LPP [Table 4], [Figure 9]. Lichen planus pemphigoides is an acquired autoimmune dermatosis and LP lesions usually precede the vesicobullous lesions. Clinically, LPP is characterized by developing blisters on lichenoid lesions and on uninvolved skin with more acral distribution of bullous lesions. ,, The differential diagnoses include bullous LP , or association of LP with erythema multiforme. Histological analysis reveals an intense lichenoid reaction with extensive liquefaction of basal keratinocytes. There is no linear immunostaining at the dermo-epidermal junction. 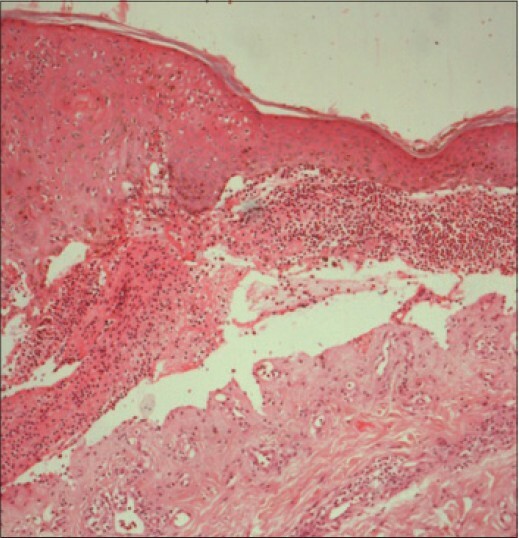 Out of two cases of pemphigus erythematosus, histopathology in first case showed subcorneal blister and acantholysis [Figure 10] and second biopsy specimen showed intraepidermal blister with perivascular and interstitial dermal infiltrate. 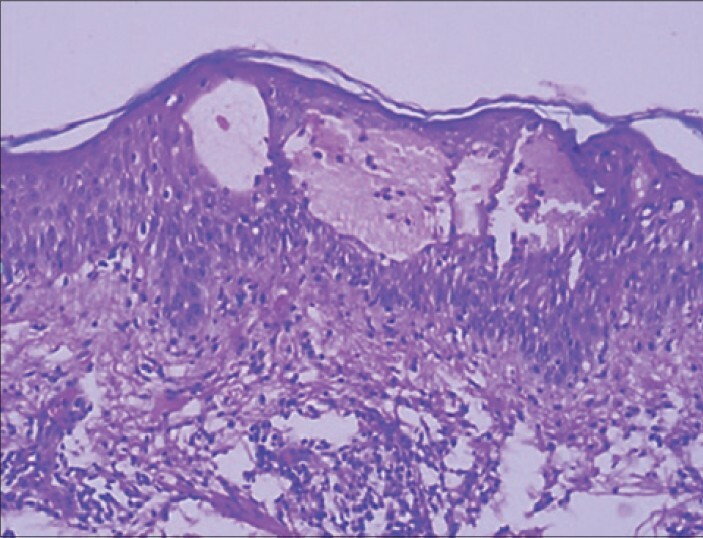 DIF of peri-lesional biopsy specimen in both the cases revealed IgG and/or C3 deposits in intercellular epidermis and dermoepidermal junction. So, DIF was helpful as both PE and PF show similar histopathology findings. Because histology is not always specific, immunopathology is very important. One case clinically suspected of CBDC, histopathology showed subepidermal cleft with upper dermal mast cell infiltrate. Giemsa stain was done, DIF was negative. And a diagnosis of bullous mastocytosis was made. Cases of limited number in our studies were CBDC, pemphigus vegetans, lichen planus pemphigoid and pemphigoid gestationis. DIF microscopy evaluates tissue for the presence of autoantibodies, complements, and fibrin. It is important to take biopsy sample for DIF from appropriate site, to place it in correct transport media and to convey it to the laboratory without any delay. Failure at any of these points contributes to false negative results. Authors are grateful to faculty of Department of Pathology, Smt. Shardaben General Hospital and Dr.Sanjeev Shah, for their support in carrying out this study. 1. 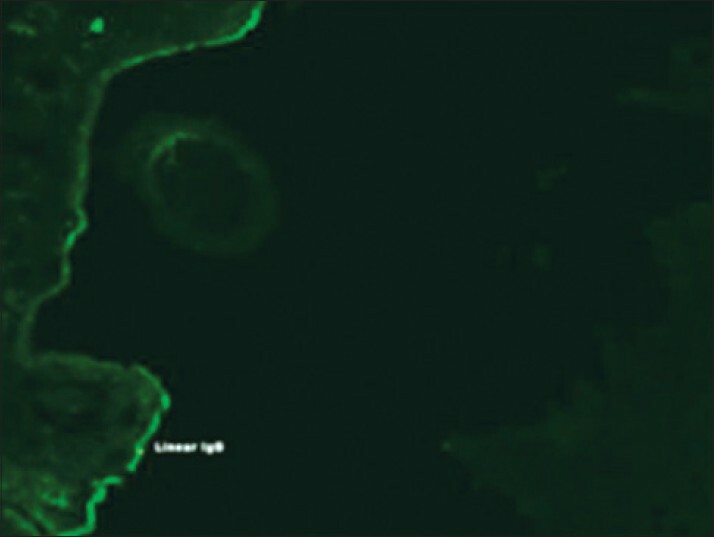 Beutner EH, Chorzelski TP, Jablonska S. Immunofluorescence tests. Clinical significance of sera and skin in bullous diseases. Int J Dermatol 1985;24:405-21. 2. Lever WF. Pemphigus. Medicine (Baltimore) 1953;32:1-123. 3. Stanley JR. Cell adhesion molecules as targets of autoantibodies in pemphigus and pemphigoid, bullous diseases due to defective epidermal cell adhesion. Adv Immunol 1993;53:291-325. 4. Amagai M. Autoimmunity against desmosomal cadherins in pemphigus. J Dermatol Sci 1999;20:92-102. 5. Sitaru C, Zillikens D. Mechanisms of blister induction by autoantibodies. Exp Dermatol 2005;14:861-75. 6. Sitaru C, Mihai S, Zillikens D. The relevance of the IgG subclass of autoantibodies for blister induction in autoimmune bullous skin diseases. Arch Dermatol Res 2007;299:1-8. 7. Kottke MD, Delva E, Kowalczyk AP. The desmosome: Cell science lessons from human diseases. J Cell Sci 2006;119:797-806. 8. Yancey KB. The pathophysiology of autoimmune blistering diseases. J Clin Invest 2005;115:825-8. 9. Balighi K, Taheri A, Mansoori P, Chams C. Value of direct immunofluorescence in predicting remission in pemphigus vulgaris. Int J Dermatol 2006;45:1308-11. 10. Beutner EH. 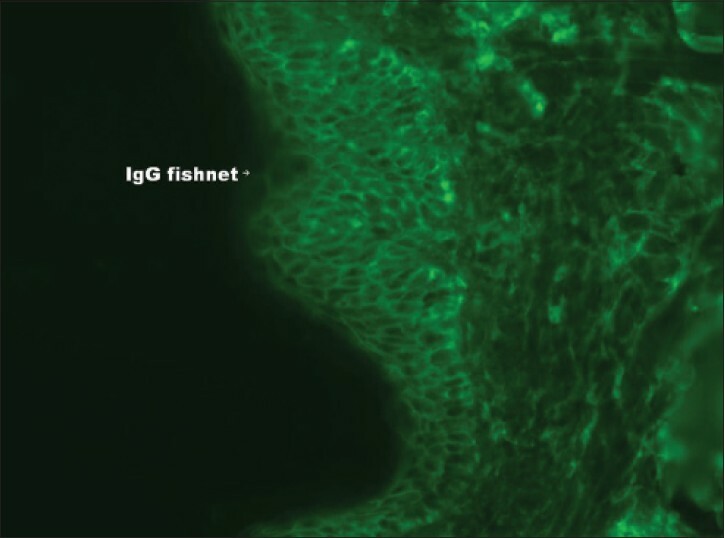 The development of immunofluorescence and the immunopathology of the skin. Int J Dermatol 2003;42:99-109. 11. Lebe B, Gül Niflioðlu G, Seyrek S, Ellidokuz H. Evaluation of clinical and histopathologic/direct immunofluorescence diagnosis in autoimmune vesiculobullous dermatitis: Utility of direct immunofluorescence. Turk Patoloji Derg 2012;28:11-6. 12. Minz RW, Chhabra S, Singh S, Radotra BD, Kumar B. Direct immunofluorescence of skin biopsy: Perspective of an immunopathologist. Indian J Dermatol Venereol Leprol 2010;76:150-7. 13. Mutasim DF, Adams BB. Immunofluorescence in dermatology. J Am Acad Dermatol 2001;45:803-22. 14. Leonard JN, Haffenden GP, Fry L. Dermatitis Herpetiformis. In: Beutner EH, Chorzelski TP, Kumar V, editors. Immunopathology of the skin. 3 rd ed. Vol I. New York: John Wiley and Sons Inc; 1987. p. 443. 15. Alonso-Llamazares J, Gibson LE, Rogers RS 3 rd . Clinical, pathologic and immunopathologic features of dermatitis herpetiformis: Review of the Mayo Clinic experience. Int J Dermatol 2007;46:910-9. 16. Sousa L, Bajanca R, Cabral J, Fiadeiro T. Dermatitis herpetiformis: Should direct immunofluorescence be the only diagnostic criterion? Pediatr Dermatol 2002;19:336-9. 17. Maciejowska E, Jablonska S, Chorzelski T. Is pemphigus herpetiformis an entity? Int J Dermatol 1987;26:571-7. 18. Cohen DM, Ben-Amitai D, Feinmesser M, Zvulunov A. Childhood lichen planus pemphigoides: A case report and review of the literature. Pediatr Dermatol 2009;26:569-74. 19. Stavropoulos PG, Leonforte JF, Gollnick H, Tuderman LB, Zouboulis CC. Lichen planus pemphigoides: Another paraneoplastic bullous disease? J Eur Acad Dermatol Venereol 1997;9:62-7. 20. Yoon KH, Kim SC, Kang DS, Lee IJ. Lichen planus pemphigoides with circulating autoantibodies against 200 and 180 kDa epidermal antigens. Eur J Dermatol 2000;10:212-4. 21. Lee J, Dasher M, Stadecker MJ, Sobell JM. Vesicles in a patient with a lichenoid eruption: Quiz case. Arch Dermatol 2003;139:1363-8. 22. Swale VJ, Black MM, Bhogal BS. Lichen planus pemphigoides: Two case reports. Clin Exp Dermatol 1998;23:132-5.